Recognizes a protein of 210-220kDa, which is identified as the complement receptor 1 (CR1)/CD35. This MAb does not block CR1 activity. It is highly specific to CR1 and shows no cross-reaction with CR2. The primary function of CR1 is to serve as the cellular receptor for C3b and C4b, the most important components of the complement system leading to clearance of foreign macromolecules. The Knops blood group system is a system of antigens located on this protein. Follicular dendritic cells (FDC) are restricted to the B-cell regions of secondary lymphoid follicles. They are CD21+/CD35+/CD1a-. This MAb labels follicular dendritic cells and follicular dendritic cell sarcoma. Small volumes of anti-CR1 antibody vial(s) may occasionally become entrapped in the seal of the product vial during shipment and storage. If necessary, briefly centrifuge the vial on a tabletop centrifuge to dislodge any liquid in the container`s cap. Certain products may require to ship with dry ice and additional dry ice fee may apply. 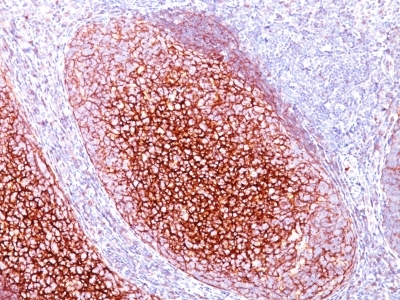 Formalin-fixed, paraffin-embedded human Tonsil stained with CD35 Monoclonal Antibody (CR1/802). NCBI/Uniprot data below describe general gene information for CR1. It may not necessarily be applicable to this product. CR1: Mediates cellular binding of particles and immune complexes that have activated complement. Belongs to the receptors of complement activation (RCA) family. 1. Knops blood group antigen a/b genotype was associated with increased susceptibility to severe malaria and the b/b genotype was associated with reduced risk of severe malaria.